Seventeen graduates from St. Vladimir’s Seminary are now being sent out as priests, deacons, and lay ministers in service to the Church. At Saturday’s Commencement Exercises, the seminary awarded diplomas in three programs: 1 Master of Theology, 8 Masters of Divinity, and 8 Masters of Arts degrees. 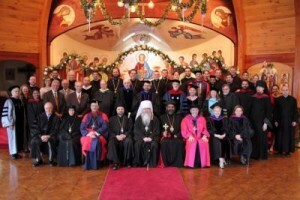 Graduates represented a broad range of ecclesial jurisdictions and included both Eastern and Oriental Orthodox Christians; four priests and one deacon were among the graduates. Additionally, the Board of Trustees awarded three accomplished Orthodox Christians honorary degrees. Doctorates of Humane Letters honoris causa were bestowed upon Seminary Trustees Brian Gerich and Anne Glynn Mackoul, and upon Mother Ines Ayau García, abbess of Hogar Rafael Ayau, an Orthodox Christian orphanage in Guatemala. Commencement crowned the week’s celebrations, which also included the annual Board of Trustees meeting, a Trustee–Student dinner on Thursday evening, and a Friday Trustees dinner with staff and faculty. On Saturday morning, May 18, His Beatitude Metropolitan Tikhon, primate of the Orthodox Church in America (OCA), and His Grace Nicholas (Ozone), auxiliary bishop for Brooklyn, Self-Ruled Antiochian Orthodox Archdiocese of North America (AOCANA), concelebrated the 9:00 a.m. Divine Liturgy, in which second–year seminarian and Commencement Salutatorian Nicholas Roth was ordained to the Holy Diaconate. His Beatitude also presided at the 2 p.m. Service of Supplication (Molieben) in the campus Chapel of the Three Hierarchs before joining the faculty, staff, graduates, and visitors for Commencement ceremonies which followed. Board of Trustees member His Eminence Metropolitan Zachariah Mar Nicholovos, Northeast American Diocese of the Malankara Orthodox Syrian Church, also attended the Molieben and participated in the graduation exercises. The Valedictorian and Salutatorian were selected by the faculty on the basis of their excellent performance in all aspects of seminary life, including academic work, participation in chapel services, and completion of community service assignments. Class Valedictorian Harrison Russin, Student Ecclesiarch from 2011–2013, also earned a commendation for community service. Harrison was awarded the St. Basil the Great Award for high academic achievement twice during his tenure at St. Vladimir’s, and is a gifted musician who sang with the SVOTS Octet all three years. His thesis was titled “The Iconology of Fr. Sergius Bulgakov.” Harrison will begin a Ph.D. program in the fall of 2013 at Duke University in Durham, North Carolina, studying in the field of musicology. This year for the first time, the Student Council presented a new award to a faculty member. Decided by student vote, the St. Macrina the Great Award recognizes the dedication and achievements of a St. Vladimir’s professor. In its inaugural year, outgoing Student Council President The Rev. James Parnell presented the award to The Very. Rev. Dr. Alexander Rentel, assistant professor of Canon Law and Byzantine Studies and The John and Paraskeva Skvir Lecturer in Practical Theology. Anna Margheritino, wife of Seminarian Sandro Margheritino, was commissioned to make two icons for the St. Macrina Award; one will be continually displayed on campus, and each year, another will be presented to the Award recipient. The entire campus community wishes the Class of 2013 many years! View the Commencement photo gallery and the gallery of the morning Liturgy and ordination. Today the Russian Orthodox Church begins the Nativity Fast.